Lucic is at the age where we can expect to see a decline in his performance and while next season is very likely to be better than the last season I don’t think he’ll ever have a season like he did in 2016-17 again. Lucic has a NMC which will really hurt the Oilers at the next expansion draft when Seattle becomes an NHL team. The team will be forced to protect players with NMC’s so will lose a better, younger player than Lucic if he’s still around. The Oilers NEED the cap space this season to be competitive. Even with the salary cap increasing to $80M dollars for next season the Oilers will be tight against it just to bring back the same team. Moving Lucic’s $6M cap hit would allow them to add a piece to improve the team. The Oilers re-signed Cagguila for two years at a $1.5M cap hit and Benning for two years at a $1.9M cap hit. It didn’t take long after either signing for fans to light up Peter Chiarelli for overpaying these players who many thought would come in a few hundred thousand dollars less. Personally I don’t mind these deals too much, sure I would have liked the cap hit to be a bit lower but I really like Benning and think that the $1.9M cap hit could work out to be a value contract. Cagguila brings value because he’s so versatile in that he can play any forward position and can move up and down the lineup as needed. At this point fans have turned on Chiarelli to the point that he’s going to get ripped in social media for every move he makes. I understand the hatred though, I think the Hall trade will be remembered for a really long time for how one sided it was but he is the GM and I think its important to analyze any trades or signings he makes without bringing the past into it. Taylor Hall won the Hart trophy last night and I don’t want to add on to all the Chiarelli hate, there’s enough of that already. I do feel good for Hall and I think he deserves it and would have loved to see him have success in Edmonton. With the 10th overall selection the Oilers Select…. 30% – Ty Smith – He’s likely to be there at 10th and is the safe pick in my opinion from the players available. 25% – Barrett Hayton – Also likely to there at 10th and a safe pick. Two way center. 15% – Adam Boqvist – Higher ceiling than Smith but a risky pick. May not be available. 10% – Trade – Please don’t be another Reinhart trade!! 10% – Adam Bouchard – I think the Oilers would love it if he’s there at 10th but its not likely. 5% – Quinn Hughes – If he’s available at 10th a few teams will likely regret it. 5% – Oliver Wahlstrom – The perfect fit for Mcdavids wing? We can dream. The scariest scenario for me is if Chiarelli trades the pick… this guy really scares me. This entry was posted in Uncategorized and tagged Benning, Cagguila, Chiarelli, Lucic, NHL Draft on June 21, 2018 by jtunnicliff. As everybody is likely aware of by now the Oilers have signed the NCAA C Cooper Marody to an entry level contract. Although the contract details are not confirmed capfriendly.com has the numbers at 3 years with a $925k cap hit and there is no word of bonuses as of yet. To help get an idea of how Marody will fit into the Oilers forward depth charts I’ve put together a table comparing his NCAA seasons to Drake Cagguila, Patrick Russell and Joseph Gambardella all of whom were signed as UFA’s from the NCAA. Note that these players all finished their NCAA careers and were UFA’s as they didn’t sign with the NHL team that had drafted them while Marody is turning pro with 1 year of NCAA eligibility remaining. This entry was posted in Offseason Predictions and tagged Cooper Marody, Drake Cagguila on April 10, 2018 by jtunnicliff. The Oilers 2018 -2019 Cap Situation? The Oilers have 15 players under contract for next season at a cap hit of a touch over $62M. With the cap expected to be in the range of 78 – 82 million next season that may not seem like such a bad spot to be in but let’s look a bit closer. This entry was posted in Management, Offseason Predictions, Rumors, Trades and tagged Salary Cap on April 9, 2018 by jtunnicliff. 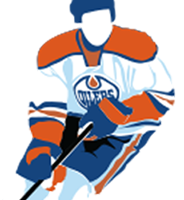 The Oilers closed out the season last night with a 3 – 2 victory over the Vancouver Canucks in a shootout. Normally that would be a good thing but in this case the win moved the Oilers past the Blackhawks and the Rangers to finish the season in 23rd place overall or more importantly 9th last. If they had lost the game in regulation last night not only would the Sedins have left on a more positive note but the Oilers would have finished 7th last and had a better chance for a higher draft pick. This entry was posted in Draft, Random Thoughts and tagged Draft, Hart Trophy, McDavid on April 8, 2018 by jtunnicliff. Who Will The Oilers Expose In The Upcoming Expansion Draft? The NHL will hold an expansion draft on June 21st of this year in which the Vegas Golden Knights will pick one player from each team to build its roster for the 2017/18 season. Each team will have the ability to protect a list of players from the expansion draft but are required to expose a minimum number of players who meet certain criteria. This entry was posted in Draft, Management, Offseason Predictions on April 9, 2017 by jtunnicliff. On April 13th, 2006 the Edmonton Oilers beat the Anaheim Ducks 2-1 at home to clinch a playoff spot. It was their 81st game of the season and it was a great day. This is a great day too. The Edmonton Oilers beat the LA Kings 2-1 at home to clinch a playoff spot!!!! Anybody remember what they did back in the that 2006 season? This entry was posted in Uncategorized on March 29, 2017 by jtunnicliff.